Model United Nations, Geneva Style! 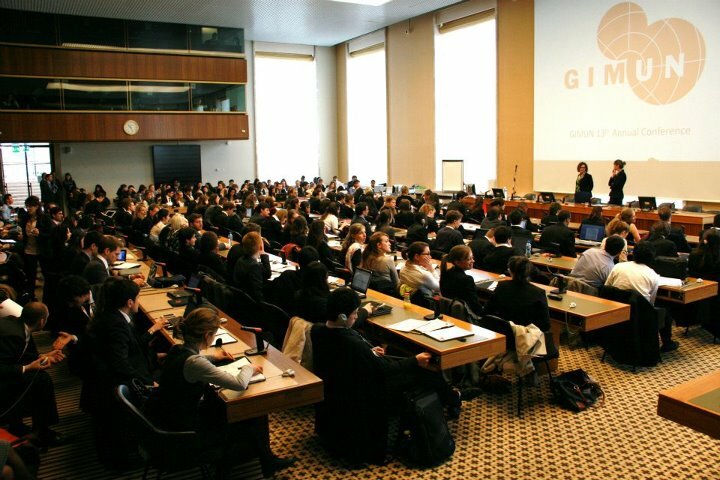 Eleven students from Pace University New York City’s Model United Nations program are participating this week at GIMUN, held in the auspicious Palais des Nations — former League of Nations headquarters and current location of the UN Office at Geneva. The GIMUN conference mirrors its 2012 theme of “Achieving Dialogue and Development through Cultural Diversity.” Participants hail from 49 countries, and committee sessions are simultaneously translated between French and English. Student delegates are discussing a broad range of issues, including conflict in Southeastern Europe and India, the rights of LGBTQ people, multilateral debt relief, the humanitarian impact of climate change, religious freedom and ending poverty. For more information on GIMUN, read this interview with Nicolas Vetterli, president of GIMUN. For regular updates on the conference, follow the daily GIMUN newspaper Perspectives or the official GIMUN Twitter feed and ‘like’ GIMUN on Facebook. This entry was posted in News and tagged Geneva, Geneva International Model United Nations, GIMUN, Kassym-Jomart Tokayev, Model UN, Model United Nations, MUN, New York City, Pace University, Palais des Nations, UN, UN Office in Geneva, United Nations, UNOG. Bookmark the permalink.